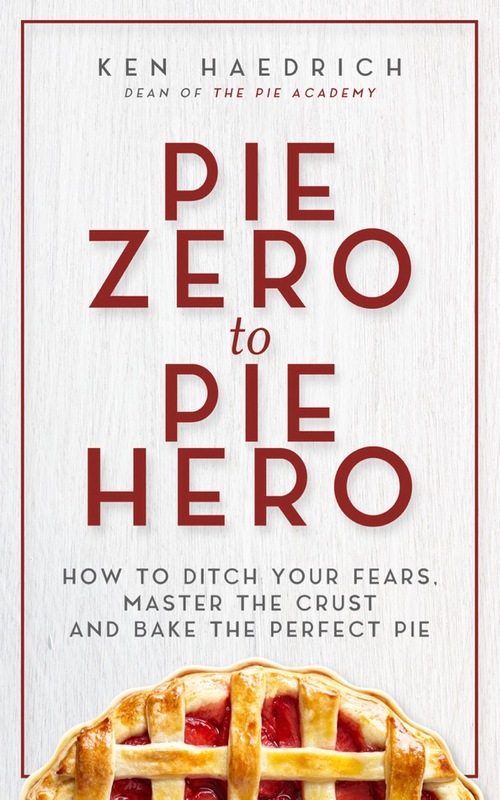 As I mentioned last week, I’ve been testing custard pie recipes for my book-in-progress, and now that I’m nearing the end of this chapter it’s time to move on. It won’t be easy. Not that the pie territory ahead is any less promising. It’s simply that I’ve re-fallen in love with custard pies in a big way, been captured by their spell, and charmed by their quirks all over again. That’s all I’m saying. 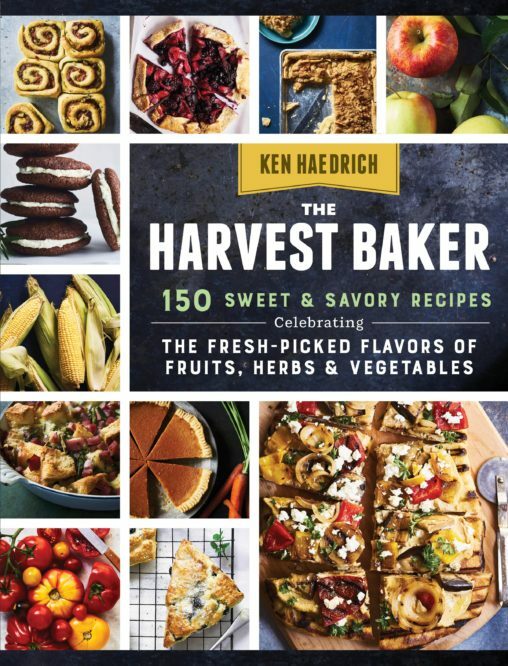 You’ll find all of my favorites once the new book is out later in 2020. 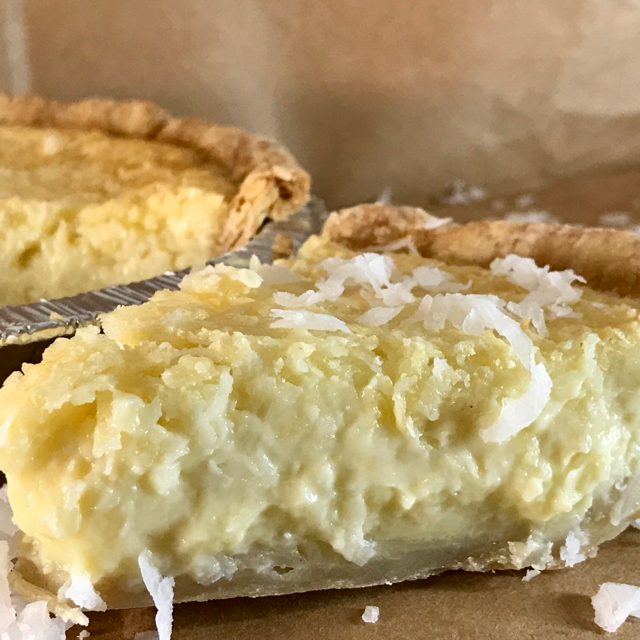 I know it’s a long time to wait, but to tide you over, here’s the Creamy Coconut Custard Pie recipe from the forthcoming book. 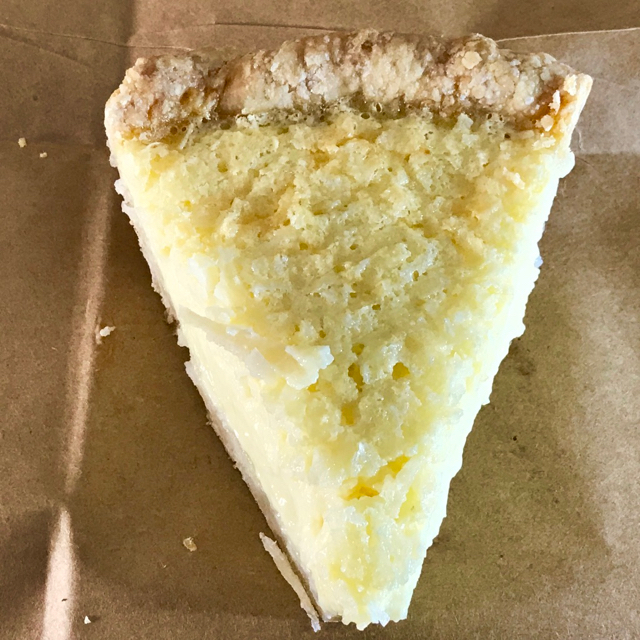 Unlike last week’s Toasted Almond Coconut Custard Pie, this one is for coconut custard pie purists, an ultra-rich version thanks to the heavy cream and extra yolks. As a little bonus for you, I’ve taken some of the lessons I’ve gleaned from my custard pie testing and put them into the video you’ll find below. Enjoy the video, enjoy the recipe, and let me know if you have any custard pie wisdom you’d like to share. If so I’d love to hear from you. 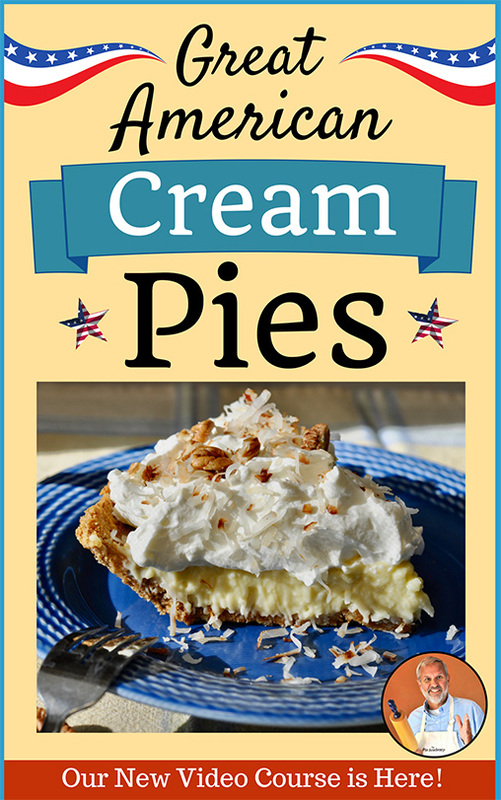 And don’t forget, if you know of anyone who is a custard pie lover who might enjoy this recipe and video, I hope you’ll pass along the link to this page. I would really appreciate that. PASTRY NOTE – Virtually any single crust pie dough recipe will work for this pie. If you don’t already have a favorite, let me suggest the Simple Pie Dough by Hand. 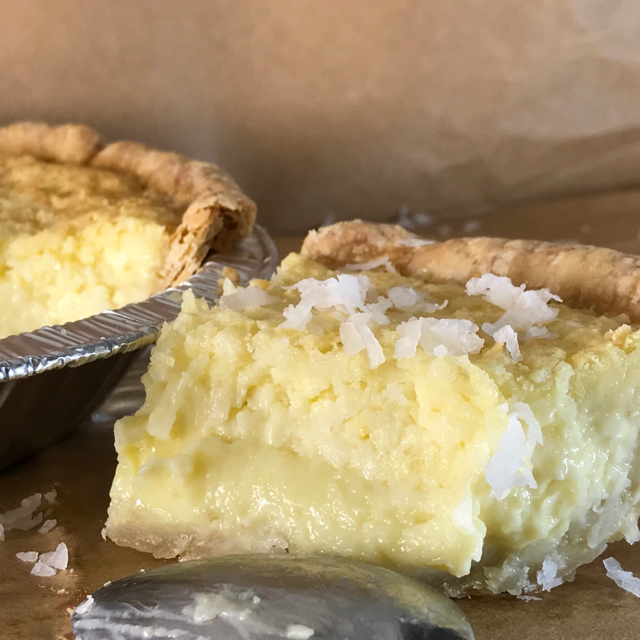 A coconut pie for purists, this custard pie is smooth as velvet. I highly recommend using the coconut extract, which you should find in your market with the other extracts. If you haven't already, prepare and refrigerate your pie dough for at least 45 minutes. 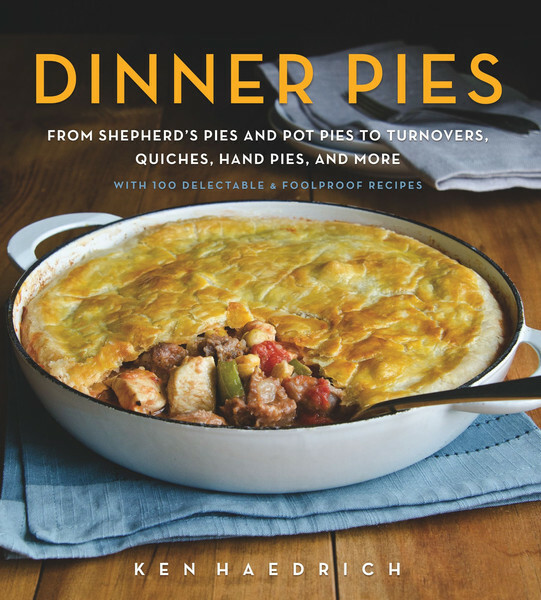 Roll the dough into a 12 1/2- to 13-inch circle and line a 9 1/2-inch deep-dish pie pan with it. Form the overhanging dough into an upstanding ridge. Flute or crimp the ridge and refrigerate the shell for 30 minutes. Set the oven to 350°. Combine the eggs and egg yolks in a large bowl and beat on medium speed with an electric mixer - hand-held is fine - gradually adding the sugar. Add the heavy cream, milk, vanilla, coconut extract (if using) and salt; beat briefly, just until evenly combined. Stir in the coconut. Put the pie on a baking sheet, near the oven, then slowly pour or ladle the filling into the shell. Put the baking sheet and pie on the middle oven rack and bake just until the custard is set, about 50 minutes, turning the pie 180 degrees midway through the baking. When the pie is done the filling will be wobbly, and there will be no sign of soupiness at the center of the filling. Give the pie a little nudge to check. Transfer the pie to a rack and cool on the sheet. Cool thoroughly, then refrigerate for at least 2 or 3 hours before serving. Cover with tented aluminum for longer storage in the fridge.